Allophane: Mineral information, data and localities. From the Greek άλλος ("allos") for "other" or "different" and φαίνεσθαι ("phaenesthai"), "to appear", in allusion to the change it undergoes in a blowpipe flame. Amorphous hydrous silicate of aluminium, composition not fixed. Principal member of the nominal "Allophane Group." Copper-bearing varieties can be confused with chrysocolla. Colourless varieties may be confused with hyalite. The nano-sized particles have a ball-shaped morphology. 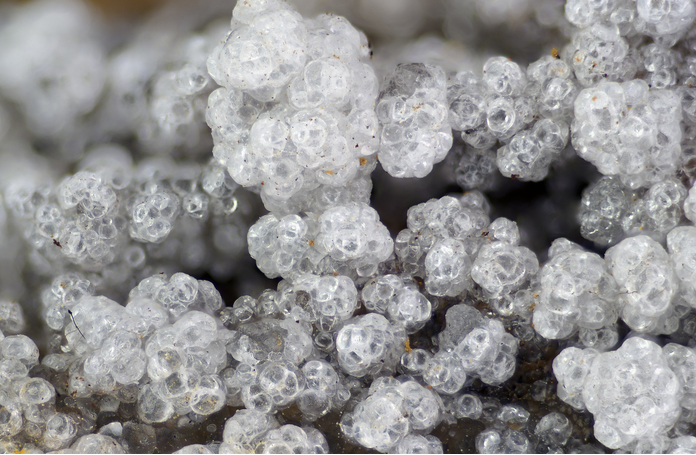 Rarely observed as ring-shaped particles, with diameters of 50 ºA, which in three dimensions may represent sections through hollow spherules or polyhedra. As hyaline crusts and masses; stalactites and flowstones. Mining Academy, Freiberg, Germany, 26104. Cupro-Allophane A variety of Allophane containing Cu. Originally described from Moscow Oblast' (Moscovskaya Oblast'), Central Region, Russia. Phosphate-Allophane A variety containg 7.97% P2O5. Plumballophane A silica-alumina gel containing PbO. Malachite 39 photos of Allophane associated with Malachite on mindat.org. Azurite 38 photos of Allophane associated with Azurite on mindat.org. Baryte 11 photos of Allophane associated with Baryte on mindat.org. Dundasite 10 photos of Allophane associated with Dundasite on mindat.org. Hessonite 10 photos of Allophane associated with Hessonite on mindat.org. Anorthite 10 photos of Allophane associated with Anorthite on mindat.org. Brochantite 8 photos of Allophane associated with Brochantite on mindat.org. Alumohydrocalcite 7 photos of Allophane associated with Alumohydrocalcite on mindat.org. Copper 6 photos of Allophane associated with Copper on mindat.org. Quartz 6 photos of Allophane associated with Quartz on mindat.org. Hausmann, J.F.L. and Stromeyer, F. (1816) Über Silberkupferglanz und Allophan. Göttingische Gelehrte Anzeigen: 2: 1251-1253. Dana, E.S. (1892) Dana's system of mineralogy (6th edition), 693-694. Kitagawa, Y. (1974) Dehydration of allophane and its structural formula. American Mineralogist: 59: 1094-1098. Henmi, T. and Wada, K. (1976) Morphology and composition of allophane. American Mineralogist: 61: 379-390. Wada, S.I. and Wada, K. (1977) Density and structure of allophane. Clay Minerals Bulletin: 12: 289-298. Bailey, S.W. (1980) Summary of recommendations of AIPEA nomenclature committee on clay minerals. American Mineralogist: 65: 1-7. Parfitt, R.L., Furkert, R.J., and Henmi, T. (1980) Identification and structure of two types of allophane from volcanic ash soils and tephra. Clays and Clay Minerals: 28: 328-334.
van der Gaast, S.J., Wada, K., Wada, S.I., and Kakuto, Y. (1985) Small-angle X-ray powder diffraction, morphology, and structure of allophane and imogolite. Clays and Clay Minerals: 33: 237-243. Gaines, R.V., H. Skinner, C.W., Foord, E.E., Mason, B., and Rosenzweig, A. (1997) Dana's New Mineralogy: The System of Mineralogy of James Dwight Dana and Edward Salisbury Dana: eighth edition. John Wiley and Sons, Inc., 1819 pp. : 1432. The following Allophane specimens are currently listed for sale on minfind.com. Josef Taucher,Mineralien des Bundeslandes Steiermark; Kolitsch, U & Brandstätter, F. (2011); Taucher, J. (2013): 1828) Koninckit und Woodhouseit vom Brandberg bei Leoben. Pp. 139-141 in Niedermayr, G. et al. (2013): Neue Mineralfunde aus Österreich LXII. Carinthia II, 203./123., 91-146. Blondieau, M., Hatert, F. et Defoy, M. (2012) - Minéralogie de la carrière de Beez, Province de Namur (Belgique). Le Règne Minéral, 104, 5-26. Brydon, J.E. and Shimoda, S. (1972) Allophane and other amorphous constituents in a podzol from Nova Scotia. Canadian Journal of Soil Science: 52: 465-475. Šrein, V., Litochleb, J., Šreinová, B.: Vybrané skarnové a sblížené metamorfogenní mineralizace Českého masívu. Bulletin mineralogicko-petrografického oddělení Národního muzea v Praze, 1998, roč. 6, s. 132-146. Lapis (2002) 7/8, 63-65.; Handbook of Mineralogy. Kruťa, T.: Příspěvky k moravské topografické mineralogii VII. Časopis Moravského musea v Brně, Vědy přírodní, 1958, roč. 43, s. 39-54. Toegel, V., Šrom, R.: Olovnaté a měďnaté zrudnění na lokalitě Lipová-lázně v lomech na Smrčníku. Minerál, 2006, roč. 14, č. 2, s. 117-124. J. Sejkora et al. : Canadian Mineralogist 43:1393-1400 (2005); Zimák, J., Novotný, P., & Dobeš, P. (2005). Hydrothermal mineralization at Domašov nad Bystřicí in the Nízký Jeseník Uplands. Bulletin of Geosciences, 80(3), 213-221. Novák, F.: Alofán, grosulár a ilmenit z Křižanovic v Železných horách. Bulletin mineralogicko-petrografického oddělení Národního muzea v Praze, 1999, roč. 7, s. 183-185.
ⓘ Font Ferrière Mine ? Le Cahier des Micromonteurs (1988) 4: 6-46.; Dana 6: 693.; Handbook of Mineralogy. Lacroix, A. (1910): Minéralogie de la France et de ses colonies, Librairie Polytechnique, Ch. Béranger Editeur, Tome IV, 749. Berbain, C., Favreau, G. & Aymar, J. (2005): Mines et minéraux des Pyrénées-Orientales et des Corbières, Association Française de Microminéralogie Ed., 72-74. Ingo Loeffler specimens; Belendorff, K. (1978): Die Vererzung der Goldlagerstätte des Eisenberges bei Korbach. Ingenieurarbeit, FH Darmstadt. Schnorrer-Köhler, G. (1988): Der Niederbergische Erzbezirk des Werdener Bergreviers in Nordrhein-Westfalen. Lapis 13(1): 11-35; Schnorrer-Köhler, G. (1991): Mineralogische Notizen V. Aufschluss 42, 155-171 (Cu-bearing). Pekov, I.V., Siidra, O.I., Chukanov, N.V., Yapaskurt, V.O., Britvin, S.N., Krivovichev, S.V., Schüller, W., and Ternes, B. 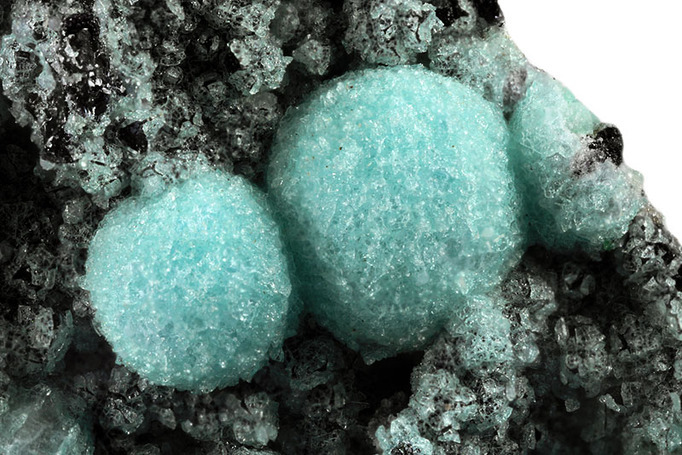 (2015) Engelhauptite, KCu3(V2O7)(OH)2 Cl, a new mineral species from Eifel, Germany. Mineralogy and Petrology, 109, 705-711.; Blaß, G. and Kruijen, F. (2015) Neuigkeiten aus der Vulkaneifel (II/2015). Mineralien-Welt, 26(5), 80-90. Blaß, G. and Schüller, W. (2012) Der Rother Kopf in der Vulkaneifel. Lapis, 37(3), 20-29.; Blaß, G. and Kruijen, F. (2015) Neuigkeiten aus der Vulkaneifel (II/2015). Mineralien-Welt, 26(5), 80-90. Hausmann, J.F.L. and Stromeyer, F. (1816) Über Silberkupferglanz und Allophan. Göttingische Gelehrte Anzeigen 2, 1251-1253.; Handbook of Mineralogy. Riedel, H., Holzhey, G., Pestel, S. & Weiß, S. (1998): Türkis aus Thüringen und Sachsen. Lapis, 23(2), 42-44.; Pestel, S. & Kasiske, J. (2007): Fundstellen im Vogtland: Jarosit-Kristalle aus Weckersdorf. Mineralien-Welt 18(5), 32-34. Wendel, W. & Markl, G. (1996): Eine Antimonit-Paragenese und weitere Neufunde aus Lavrion. Lapis, 21 (11), 40-42; 62. Redazionale (2005): Sistematica ligure: resoconto 2005. Notiziario di Mineralogia del Ferrania Club. 19 , 3-5. [MinRec 32:356]; Camarda, S., Muzio, C., Passarino, G. & Sanguineti, G. (2013). Reppia, Ne, Val Graveglia, Genova. Minerali secondari di un giacimento ferroso cuprifero. Rivista Mineralogica Italiana, 3/2013, 176-185.
ⓘ Valgraveglia Mine (Gambatesa Mine) ? ⓘ Alpe Machetto Mine ? Campostrini, I. (2001): Le miniere di Brosso. Monografie XXIX. Museo Regionale di Scienze Naturali, Ed., Torino, 185 pp. SEM/EDX by Dario Cericola; Ferretti, P., Camin, C., Fassina, B., Gentile, P., Rocchetti, I., Vecchi, F. (2018) Miniera Tingherla (Frassilongo, Valle del Fersina). Aggiornamento di una località classica della mineralogia trentina. Rivista Mineralogica Italiana, 42, 2 (2-2018), 108-141. Bazzoni, C., Betti, C., Casini, A., Costantini, A. & Pagani, G. (2015). Minerali: bellezze della natura nel Parco delle Colline Metallifere. Pacini Editore, Pisa, 266 pp. Batacchi, C., Ciriotti, M.E., Bittarello, E., Callegari, A.M., Boiocchi, M., Ceccantini, L., Fassina, B. (2013): Fosso Mandromicci, Gerfalco, Montieri (Grosseto). Nuovi ritrovamenti. Micro, 3/2013, 106-126; Bazzoni, C., Betti, C., Casini, A., Costantini, A. & Pagani, G. (2015). Minerali: bellezze della natura nel Parco delle Colline Metallifere. Pacini Editore, Pisa, 266 pp. L. Dell'Anna, C.L. Garavelli (1967) - Plancheite di Capo Calamita (Isola d'Elba) - Per. Min., 36: 126-146. Russell, J. D., McHardy, W. J., & Fraser, A. R. (1969). Imogolite: a unique aluminosilicate. Clay Miner, 8, 87-99. Yamada, S. (2004) Nihonsankoubutsu Gojuonhairetsu Sanchi-ichiranhyou, p 80. Henningsmoen, G. (1950): An occurence of Allophane in Oslo. Norsk Geologisk Tidsskrift 28, 242-244. Wieser T. 1974: Basaluminite in the weathering zone of Carpathian Flysch deposits. Mineralogia Polonica, vol. 5, 55-66. Chukhrov, F.V., Rudnitskaya, Ye.S., Moleva, V.A., Yermilova, L.P. (1965) O fosfatnykh allofanakh. Izv. Akad. Nauk SSSR, Ser. Geol., 3, 51-57. Martini, J.E.J. et al (1997) "Mbobo Mkulu Cave, South Africa", in "Cave Minerals of the World" (1997). ; Handbook of Mineralogy. Moro, M. C., Cembranos, M. L., & Fernandez, A. (2000). Allophane-like materials in the weathered zones of Silurian phosphate-rich veins from Santa Creu d'Olorda (Barcelona, Spain). Clay Minerals, 35(2), 411-421. Tomas,Ll. (1919-20): Els minerals de Catalunya. Treballs de la Inst. Catalana d'Hist. Nat. Institut d´Estudis Catalans, Barcelona. Chukanov, N.V., Göttlicher, J., Möckel, S., Sofer, Z., Van, K.V. & Belakovskiy, D.I. (2010): Åskagenite-(Nd) Mn2+NdAl2Fe3+(Si2O7)(SiO4)O2, a new mineral of the epidote supergroup. Novye dannye o mineralakh, 45, 17–22 (in Russian). New data on minerals, 45, 17–22 (in English). Volker, D. (1972): Die sulfidischen Vererzungen in den Oberhalbsteiner Serpentiniten. In: Beiträge zur Geologie der Schweiz, Lieferung 49. - Krähenbüghl H. (1982): Die Eisen- und Kupferkieslager der Nordseite des Piz Mondin im Unterengadin. Bergknappe 22, 2-5. Royal Cornwall Polytechnic Society (1870): 38. Annual Report, pp. 30-31; Collins, J.H. (1892): "A Handbook to the Mineralogy of Cornwall and Devon", 2nd ed., D. Bradford Barton Ltd. (Truro, UK), 108 pp. Kingsbury, A.W.G. (MS1) (1953 or later) Investigation of the minerals of the Lake District, especially the Caldbeck area, in collaboration with J. Hartley. List of minerals found by us at many localities examined 1947-.; Cooper, M.P. and Stanley, C.J. (1990) Minerals of the English Lake District: Caldbeck Fells. Natural History Museum Publications, London, 160 pp. (referring to Kingsbury, 1953). [Specimen in the Natural History Museum, London]; Handbook of Mineralogy. Jenkins, D.A. & Johnson, D.B., 1993. Abandoned metal mines: a unique mineralogical and microbiological resource. Journal of the Russell Society, 5, 40-44. Anthony, J.W. et al. (1995) Mineralogy of Arizona, 3rd. ed. : 105.; Blaß, G. and Kruijen, F. (2015) Neuigkeiten aus der Vulkaneifel (II/2015). 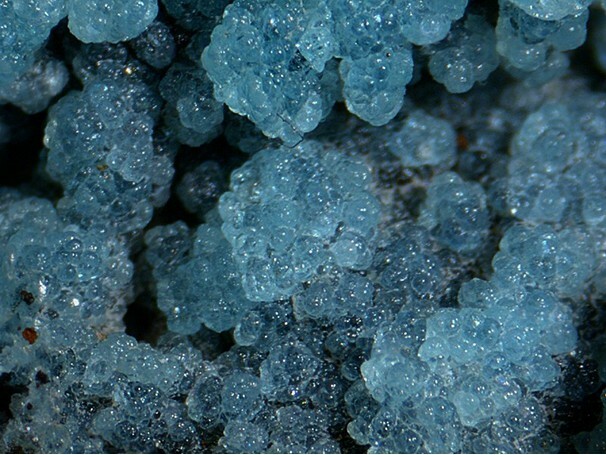 Mineralien-Welt, 26(5), 80-90.; Handbook of Mineralogy. Anthony, J.W., et al (1995), Mineralogy of Arizona, 3rd. ed. : 66.; Handbook of Mineralogy. Anthony, J.W., et al (1995), Mineralogy of Arizona, 3rd.ed. : 105; Peterson, N.P. (1962), Geology and ore deposits of the Globe-Miami district, AZ, USGS PP 342. Anthony, J.W., et al (1995), Mineralogy of Arizona, 3rd.ed. : 105; Schwartz, G.M. (1947), hydrothermal alteration in the 'porphyry copper' deposits, Econ.Geol. : 42: 319-352; Schwartz, G.M. (1956), Argillic alteration and ore deposits, Econ.Geol. : 51: 407-414. Anthony, J.W., et al (1995), Mineralogy of Arizona, 3rd.ed. : 105. Anthony, J.W., et al (1995), Mineralogy of Arizona, 3rd.ed. : 105; Schwartz, G.M. (1947), Hydrothermal alteration in the 'porphyry copper' deposits, Econ.Geol. : 42: 319-352; Schwartz, G.M. (1958), Alteration of biotite under mesothermal conditions, Econ.Geol. : 53: 164-177; Moolick, R.T. & J.J. Durek (1966), The Morenci district, in S.R. Titley and C.L. Hicks (eds. ), Geology of the porphyry copper deposits, southwestern North America. Univ. Arizona press, Tucson: 221-231. MRDS database Dep. ID #10027138, MRDS ID #M002216. Anthony, J.W., et al (1995), Mineralogy of AZ, 3rd. ed. :105; Romslo, T.M. (1948), Antler Cu-Zn Dep., Mohave Co., AZ, US Bur. of Mines Report of Invest. 4214. Anthony, J.W., et al (1995), Mineralogy of Arizona, 3rd.ed. : 105; Schwartz, G.M. (1947), Hydrothermal alteration in the 'porphyry copper' deposits, Econ.Geol. : 42: 319-352. Anthony, J.W., et al (1995), Mineralogy of Arizona, 3rd.ed. : 257; Schwartz, G.M. (1947), Hydrothermal alteration in the 'porphyry copper' deposits, Econ.Geol. : 42: 319-352; Schwartz, G.M. (1952), Chlorite-calcite pseudomorphs after orthoclase phenocrysts, Ray, Arizona, Econ.Geol. : 47: 665-672. Bideaux, Richard A. "Famous Mineral Localities: Tiger Arizona." Mineralogical Record. 11 (1980) 155-181. Anthony, J.W., et al (1995), Mineralogy of Arizona, 3rd.ed. : 105; Lovering, T.S., et al (1950), Dispersion of copper from the San Manuel copper deposit, Pinal Co., AZ, Econ.Geol. : 45: 493-514; Schwartz, G.M. (1953), Geology of the San Manuel copper deposit, AZ, USGS PP 256. Hulin, Carlton D. (1925), Geology and ore deposits of the Randsburg quadrangle, California: California Mining Bureau. Bulletin 95, 152 pp. 97; Pemberton, H. Earl (1983), Minerals of California; Van Nostrand Reinholt Press: 439. Hulin, Carlton D. (1925), Geology and ore deposits of the Randsburg quadrangle, California: California Mining Bureau. Bulletin 95, 152 pp. : 97; Murdoch, Joseph & Robert W. Webb (1966), Minerals of California, Centennial Volume (1866-1966): California Division Mines & Geology Bulletin 189: 61. Murdoch, Joseph & Robert W. Webb (1966), Minerals of California, Centennial Volume (1866-1966): California Division Mines & Geology Bulletin 189: 61. Januzzi, 1976. Mineral Localities of CT and Southeastern NY State; Schairer, John F. (1931): Minerals of Connecticut. Connecticut Geological and Natural History Survey Bulletin 51.
ⓘ Jinny Hill Mine (Cheshire Barite Mine) ? Januzzi, Ronald E. (1976): Mineral Localities of Connecticut and Southeastern New York State. The Mineralogical Press, Danbury, Connecticut. Dunham, K.C. (1933): Crystal cavities in lavas from the hawaiian islands, The American Mineralogist, Vol. 18, 369-385. The Minerals of New York City and Its Environs, NY Mineralogical Club (1931), Manchester, J.G.Canfield (1889); Amer. Museum of Nat. History, NY. Rob Lavinsky (ex. Larry Krause specimen). ; GF Loughlin (1942) Geology and ore deposits of the Magdalena mining district, New Mexico. USGS Professional Paper 200.; Handbook of Mineralogy. ⓘ Pontiac Mine (Tuck Property) ? Page, L. R.; Stocking, H. E.; Smith, H. B. (1956) Contributions to the geology of uranium and thorium by the United States Geological Survey and Atomic Energy Commission for the United Nations International Conference on Peaceful Uses of Atomic Energy, Geneva, Switzerland, 1955. USGS Professional Paper 300 pp371-374. Zeolites of the World, Rudy W. Tschernich 1992; Cerny, P., Anderson, A. J., Tomascak, P. B., & Chapman, R. (2003). Geochemical and morphological features of beryl from the Bikita granitic pegmatite, Zimbabwe. The Canadian Mineralogist, 41(4), 1003-1011.